According to a research published in the Journal of the British Association of Psychopharmacology, more damage to users and society is caused by alcohol than by marijuana. According to the researchers at the Imperial College of London, who studied “the relative physical, psychological, and social harms of cannabis and alcohol,” long-term marijuana smoking can be harmful to the lungs and circulatory system; it also influences at mental-health risks. 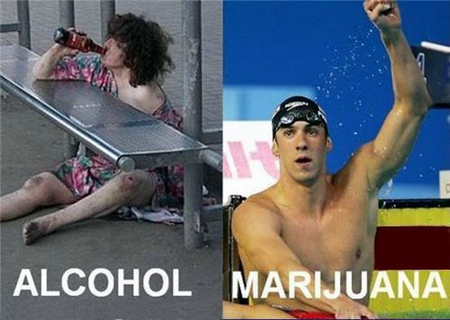 After the comparison alcohol was considered to be twice as harmful as marijuana to users, and five times more dangerous as marijuana to society. “As there are few areas of harm that each drug can produce where cannabis scores more [dangerous to health] than alcohol, we suggest that even if there were no legal impediment on cannabis use, it would be unlikely to be more harmful than alcohol” researches stated. According to the findings of the study, alcohol increase lung cancer risk by 30%, 4% of people`s deaths around the world are caused by alcohol use. Less number of deaths is caused by AIDS or tuberculosis. According to a study in the American Journal of Preventive Medicine, about 79,000 people die in US due to excessive drinking per year. In 2009, the British Columbia Mental Health and Addictions Journal published an article where it said that health costs for those drinking alcohol were eight times higher ($165 per user) when compared to those smoking marijuana ($20 per user), and 40 times higher for tobacco smokers ($800 per user). More reasons demonstrating that marijuana is less harmful compared to alcohol is covered in the book Marijuana Is Safer: So Why Are We Driving People To Drink?, coauthored by Armentano with Steve Fox and Mason Tvert.